It's a great morning around here and exactly what spring should be! Cold weather is gone, hot weather has not yet arrived, and the daytime temps are in the 70s. What could be better? Well, how about a little QKR Stampede humor and a new "Anything Goes" challenge on a Friday morning? 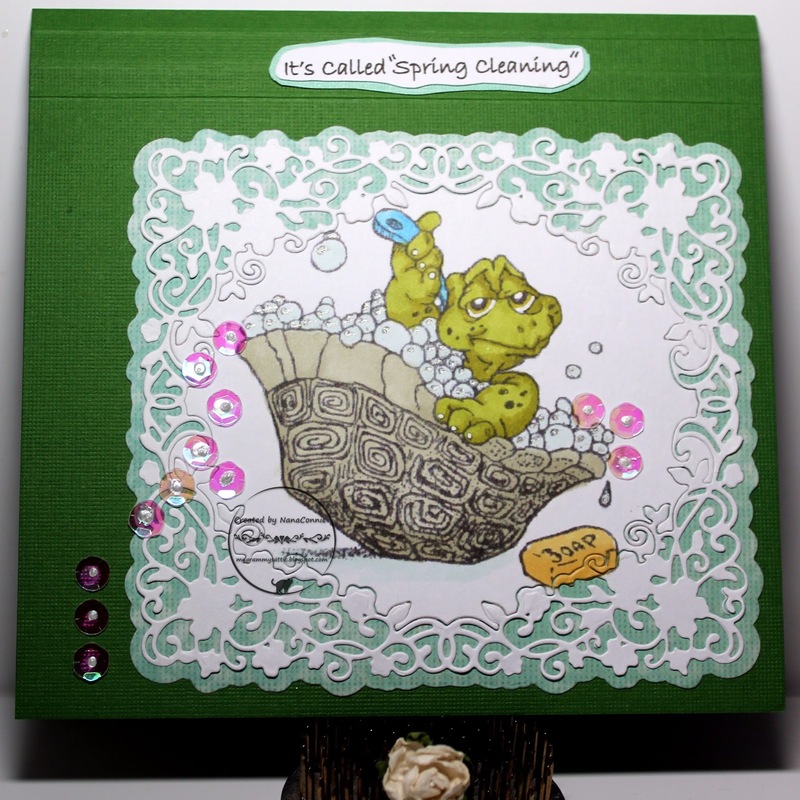 For my DT card in this challenge I used a fun QKR image called "Bathing Turtle." The sentiment which turns this card into something completely silly can only be blamed on me. I colored with ProMarkers (my favorites which I love because of the way alcohol inks blend) and watercolors, then used a Sue Wilson die to cut the image and frame. The mat is cut with the largest of the dies in that set and that paper was also water colored before being cut. Everything is mounted onto a green card base which has been scored three times at the top with my Scor-Pal. I added a teeny drop of Liquid Pearls to the center of each sequin and that's what's adhering them to the card. They give some great texture, too. This is gorgeous, love the use of the sequins as bubbles too. Spring cleaning is right - and he's even getting his shell cleaned in the process too! Love this cutie of a card. A Laugh out loud for this image and your fabulous comment, such a fabulous card, great frame die. Super cute! Thanks so much for joining us in the challenge at Scrapy Land! Lovely card. Isn't the turtle adoreable! So cute, thanks so much for joining us over at The Crafty Addicts!